Look, I know I’m blowing your mind. Three blog updates in three days? What the hell is happening over there in Villa Del Daryl? Well, the mail is happening, that’s what. A couple things — physical things, that required physical humans to carry them to my physical home — arrived in the past week, each embodying one of my stories in a new form. But because I’m on this amazing, unprecedented roll in blog posting, I’m only going to talk about them one day at a time. 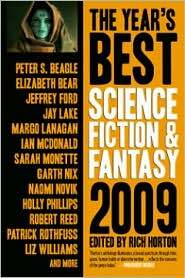 First of them was a book, The Year’s Best Science Fiction & Fantasy 2009, edited by Rich Horton. “Glass,” my story of psychopaths and mirror neurons and experimental drugs, is in there, alongside stories by some great writers — just look at those names on the cover. Hardly any of them are psychopaths.